Dr.Sharad Shangloo is a leading Physician, graduated from Rajasthan University. He had presented many scientific papers in National and International seminars on uterine fibroids and other topics. . His articles are also published in many scientific journals. 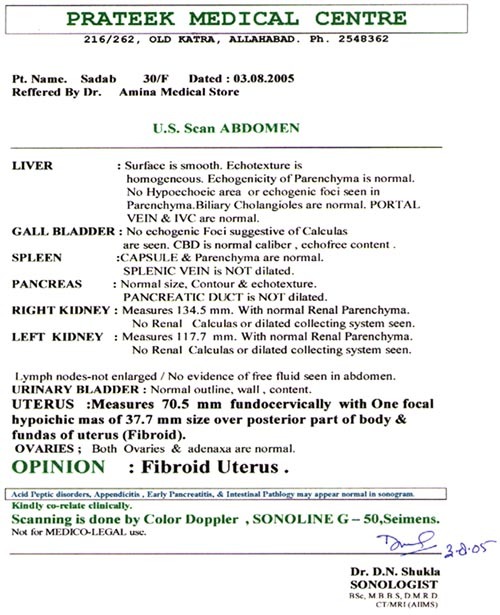 Here he presents a case of uterine fibroid. A female aged 30 years consulted me for pain in left iliac region since four months. She had regular periods with four days flow. The pain is drawing in nature > pressure, rubbing, warmth. She was irritable, depressed easily for the reason that she was not married. She had been jaundiced 4 years back. 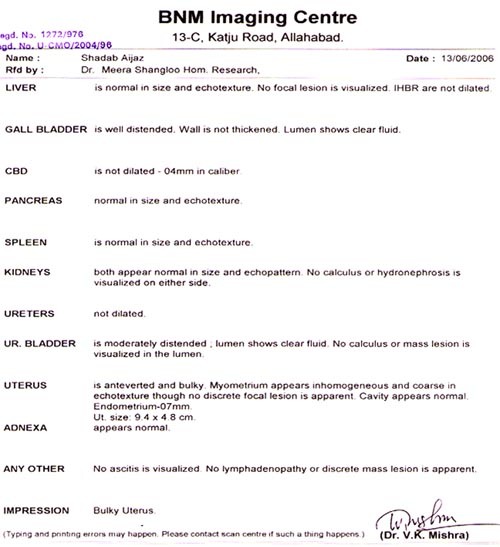 Mother passed away following renal failure. Sister had Koch’s infection and diabetic now. Sleep - Normal Food Type - Non Vegetarian. Desires for sweet, has the habits of tea, coffee. Attained puberty at the age of 14, regular, 4 days, flow normal with no significant changes. The Ultra sonogram dated 3-8-2005 revealed: The Uterus Measures 70.5 mm fundocervically with one focal hypoechoeic mass of 37.7mm size over the posterior part of the body. 1. Mother died of renal failure. In case of renal failure Medorrhinum has got a role to play at some point of time in almost all cases. 4. Depression (Homoeopathic Medical Repertory by Robin Murphy- page - 1307- Mind - Depression- Medorrhinum- Grade - 3). Pain in left lower abdomen, pulsating pain, pain increases and decreases gradually > movement and cold application. Thirstlessness. Pulsatilla 200/ tds for twp days relieved the pain. No pain, Medorrhinum was repeated again. The Ultrasound dated 13/6/2006 - Myometrium appears inhomogeneous and course in echo texture, though no discreet focal lesion is apparent. Bulky Uterus size- 9.4*4.8cm. Medorrhinum 200 was repeated every month. For three months and Medorrhinum 1000 was followed for further three months.